First you need to decide how you are going to take the pictures for you photo booth. There are plenty options to choose from, it just depends on your budget and what you want. If none of these options work for you, you can have your guests take pictures from their smart phone and share them on their social media pages. You can create a special wedding day hashtag and ask guests to use it so it’s easier to find pictures from your big day. Digital Camera: You can use a digital or DSLR camera because it already has a setting for a shutter release remote. If you don’t have one, ask friends and family members if they have one to borrow. IPad: IPads are useful because there are several apps that allow you to create a photo booth on your IPad. Many of these apps such as the Wedding Booth, CustomBooth, or Simplebooth apps allow you to print, send, and save the pictures to an online album. Instant Camera: Instant cameras are a little expensive but allow you to take pictures and immediately print the picture straight from the camera. Tripod: This is to set up whatever you are using to take your pictures so that the camera is sturdy and doesn’t move. Remote Shutter Release: A remote shutter release is a remote that you can use for your digital camera or IPad to help you take pictures while your device is on a tripod. You can find them relatively cheap and order them from Amazon or EBay. Using a remote shutter release also gets rid of the need to have someone at the photo booth taking pictures the entire night. One of the biggest components for the photo booth is to create a backdrop. You can use a variety of things for a backdrop or use a simple backdrop and make it ornate with the accessories and props. The design and decorations of the backdrop depend on your wedding’s theme and whether it is indoors or outdoors. Outdoors: If the wedding is outside you can do several things to make the outdoor elements part of the backdrop. You can hang a variety of frames that would be used as both props and a backdrop. Or, for example, if you are having a vintage themed wedding by a barn, you can use stacks of hay for seats and hang streams of burlap for the backdrop. If you love crafting, you can make a backdrop out of plywood and paint it so that it matches your outdoor wedding theme. Indoors: For indoors weddings, you don’t have the outside elements to help with your backdrop, but you can get creative and use a lot of other things to enhance your photo booth. You can use anything from patterned fabric to balloons. If you want a monogram or special design, you can create a backdrop on Photoshop and get it printed. Don’t be afraid to get creative and hang streamers, garland and decorative flowers from the wall or a rod. You’re going to need some props for your photo booth! Props can range anything from household items to more DIY crafts. You can use old hats and Halloween costumes. If you want guests to write personal messages in their pictures, put mini whiteboards or chalkboards with the props. 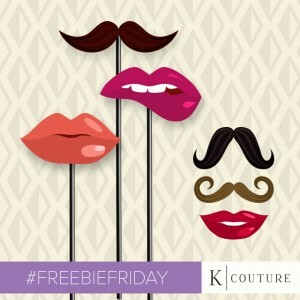 You can even print out K Couture’s FREE fun mustache cutouts printable and hot glue them to lollipop or Popsicle sticks. Once you have all your props, make a prop table or bring a large trunk to fill with all of the props. If you aren’t going to use an instant camera, you can set up a printer that connects to the digital camera or IPad wirelessly. Guests will be able to print a copy of the picture for the guest book and keep one for themselves. Set up a table next to the photo booth with a printer, scrapbook, and notecards. Guests can put one of the pictures in the scrapbook and use the notecards to write letters to the bride and groom and put it next to their picture. Now that you know how to create your own DIY photo booth, it’s time to put it together! Follow these quick steps to put together your fabulous photo booth for your wedding! Find a spot within your reception or cocktail hour to assemble the photo booth. You want a spot that has a lot of lighting and room for everything. Hang up the backdrop and decorate the space. You can add lighting, chairs, pillows and other accessories to make the booth really unique. Put together the camera, tripod and remote shutter release. Make sure it is spaced out from the backdrop so that it is not at a weird angle and will capture everyone in the picture. Double check to make sure it works. If you are using a digital camera or IPad, make sure it’s fully charged or next to an outlet so that it can be plugged in throughout the event. Set up the props in a trunk or table next to the booth so guests can go through and pick which props they want to use for the booth. This is also where you would put the white or chalkboard for guests to write messages for the pictures. On the other side of photo booth put a table with a scrap book, pens, notecards and a printer. You can add other last minute wedding decorations like candles and flowers throughout the booth to make it match your wedding décor.